playing host to numerous West End musicals, the Piccadilly Theatre has a lush Art-Deco interior. We recommend using public transportation to get to the Piccadilly Theatre. The nearest underground station to the Piccadilly Theatre is Piccadilly Circus (Bakerloo/Piccadilly Lines) Shaftesbury Avenue and Regent Street bus stops are also near the theatre. They host multiple bus lines: (Shaftesbury Avenue) 12, 14, 19, 38; (Regent Street) 6, 13, 15, 23, 88, 94, 139, 159, 453 and Night Buses (Shaftesbury Avenue) 14, N19, N38; (Regent Street) 6, 12, 23, 88, 94, 139, 159, 453, N3, N13, N15, N109, N18, N136. If arriving by train the nearest railway station is Charing Cross Station. If driving to the theatre, the nearest car parks are in Brewer Street and the Q-Park (which offers Q-Park Theatreland Parking) China Town in Newport Place. The Piccadilly Theatre is situated on Denman Street in London's West End, hidden behind Piccadilly Circus. Owned and operated by the Ambassador Theatre Group, The Piccadilly Theatre plays host to the London West End adaptation of the Oscar winning film Dirty Dancing by original writer Eleanor Bergstein, and directed by Sarah Tipple. The show features many of the songs from the famous original movie soundtrack such as "Hungry Eyes" and "I've Had The Time of My Life" to name just two, along with a collection of fantastic new songs. At its grand opening in April 1928, the Piccadilly Theatre was one of the largest theatres to be built in London with a 1,400 seat capacity, since reduced to 1,232. Its souvenir brochure claimed, ''If all the bricks used in the building were laid in a straight line, they would stretch from London to Paris''. The opening production starred one of the most acclaimed actresses of the period, Miss Evelyn Laye. In its early days, the Piccadilly operated as a cinema and made entertainment history when it premiered the very first talking picture to be shown in Britain, The Singing Fool with Al Jolson. He also opened The Jazz Singer in 1928 and appeared afterwards on-stage to sing Mammie. The Piccadilly Theatre, London has presented most forms of stage entertainment from Who's Afraid of Virginia Woolf? (with its original Broadway cast) to A Night with Dame Edna. There have been a variety of Royal Shakespeare Company productions including Edward II starring Ian McKellen, and Henry Fonda also made his West End debut in the solo play, Clarence Darrow and Y. The 1990's witnessed an expansion in musicals, ballet and dance, notably the most successful commercial ballet season ever to play in the West End, with Adventures in Motion Pictures' Swan Lake. The Piccadilly has been home to a season of plays directed by Sir Peter Hall, starring famous names such as Judi Dench, Michael Pennington, Julia MacKenzie and Eric Sykes. It has also hosted the smash-hit musical Spend Spend Spend starring the Olivier award-winning actress, Barbara Dickson, the sell-out run of Shockheaded Peter, Noises Off starring Lynn Redgrave, Ragtime, the transfer of the National Theatre's acclaimed production of Jumpers and more recently Jailhouse Rock. 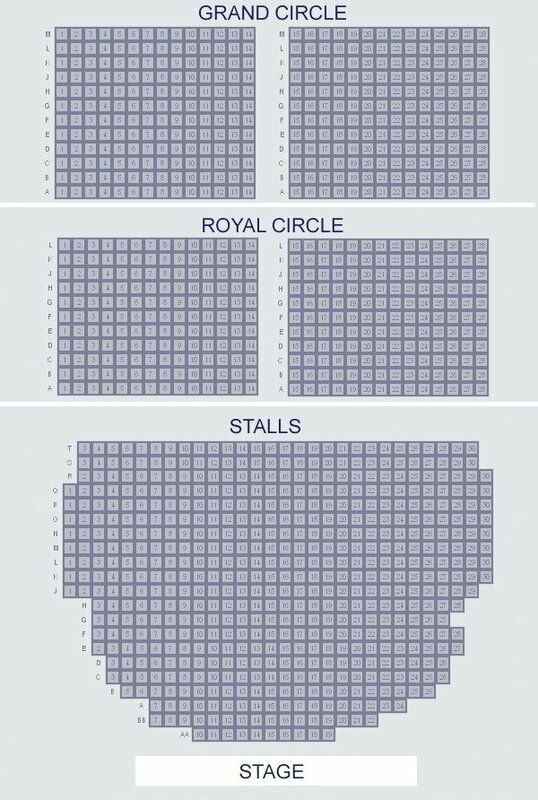 The Piccadilly Theatre has a capacity of 1,232 across 3 levels: Stalls, Royal Circle, and Grand Circle.